- Each airline employee, with proper airline identification is allowed one guest in their stateroom at the same rate. A photocopy of the airline employee's valid airline badge must accompany the Interline Rate Request Form. 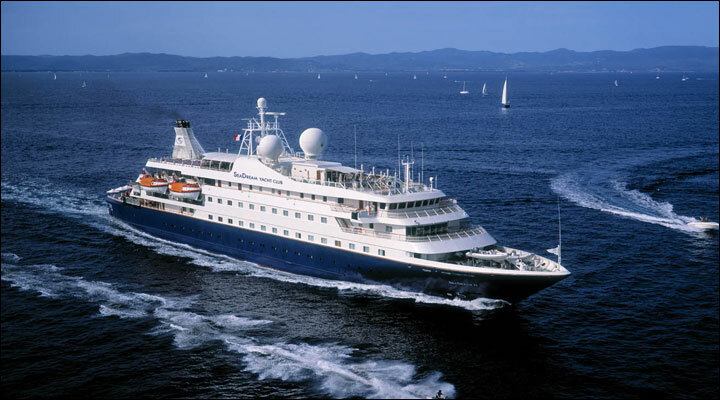 SeaDream Yacht Club requires proof of Interline Rate Eligibility immediately upon booking. Without proof of qualified interline eligibility, SeaDream Yacht Club reserves the right to automatically adjust the price to the applicable retail rate prior to departure. The twin mega yachts, SeaDream I and SeaDream II offer seven-day Caribbean and Mediterranean sailings. The elegant twins call at smaller yacht ports. There's lots of water sports activity. 'Water Toys' including wave runners, kayaks, snorkel gear, Sunfish and Zodiacs for water skiing. If you feel lazy you can snooze on deck in private Balinese sun beds---designed for two. Fun under the sun or indoors. And dining with SeaDream is superb whether you are in our main Dining Salon or up on deck in our Topside Restaurant. 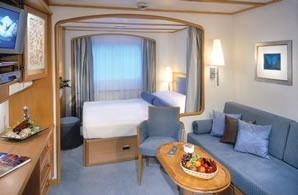 In short, the SeaDream twins offer guests the ultimate in the elegant, but, oh so casual yachting lifestyle. An intimate, friendly, comfortable, romantic yachting experience where you can always expect the unexpected. 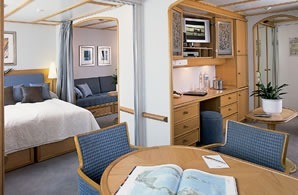 This is a dramatic, 450 square foot space for highly discriminating guests seeking the ultimate in yachting lifestyle. This suite includes a lavishly appointed separate bedroom, a living room with a large dining table as well as a bathroom featuring a fine view of the sea, and both massage shower and separate tub. As an added touch there is a separate guest bathroom.Features include a refrigerator with soft drinks, beer and water , writing desk, personalized stationary, direct dial telephones, personal safe, individually controlled AC, hair dryer, fine Belgian linens and down duvets, bath amenities by Bulgari, choice of down or synthetic pillows, slippers, a personal safe and beautiful SeaDream bath robes. Both the bedroom and living room include state of the art entertainment systems with flat screen TVs, radios, CD and DVD players. The desk is internet ready and laptops are available on request.